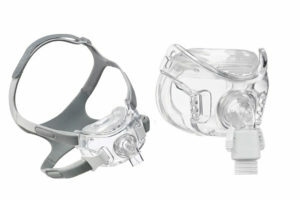 Philips Respironics’ Amara View Full Face CPAP Mask with Headgear opens the line of visibility during sleep therapy by omitting the traditional forehead support. The compact, full face mask is designed to seal around the mouth and nostrils with the help of an innovative nostril opening. The mask is secured by positioning the nasal opening under the nose and adjusting the headgear to a comfortable fit. The Amara View Full Face mask features a innovative headgear with four points of adjustment around the mask frame and a fifth point of adjustment using a crown strap at the top of the head. The crown strap crosses directly over the top of the head, creating a halo shape around the back of the user’s head. The number of adjustment options creates a design that helps promote a more secure grip and even distribution of pressure. Respironics designed a short tube for the Amara View Full Face Mask. 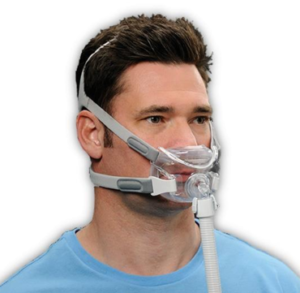 The tube extends from the front of the mask frame and connects to the cuff of the CPAP hose. Attach the built-in elbow to the mask frame and secure the swivel to the cuff of the CPAP hose. The flexible tubing moves freely with the motion of the user, giving the user more mobility. The 360 degree motion provided by the swivel causes less of a pull on the CPAP hose and increases the user’s chance of maintaining a strong seal throughout the night.